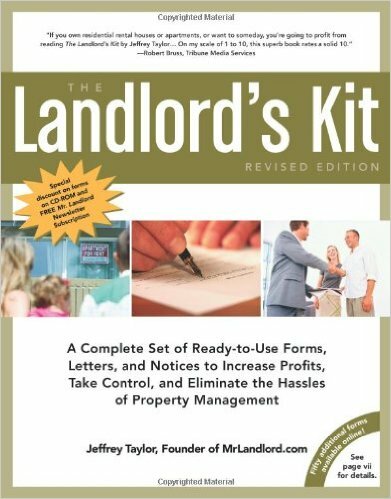 This book is considered the bible of the landlording business and has provided information about the proper way to conduct business and has guided landlords through inevitable day-to-day woes for 26 years. 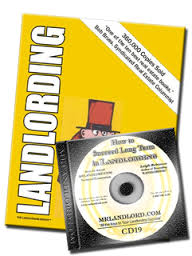 If you are a landlord and have never purchased your own copy, do so now! Landlording has twice been selected as one of the top-ten real estate books of the year by nationally syndicated real estate columnist Bob Bruss and is one of top three most recommended books on the popular MrLandlord.com Q&A forum. We have to clear out our warehouse of the 9th Edition of this best selling rental management book. This book with nearly 400,000 copies sold covers everything from shopping for supplies to setting market rents and advertising inexpensively. More than 50 forms are included. This edition includes ten forms, including an "Agreement to Hold Dwelling Off the Market", which is very useful when applicants give you a deposit to hold a dwelling for them and later decide not to take it. This agreement settles in advance who is entitled to the money and why. PLUS, when you order the information-packed book, you will receive a free BONUS CD of a Live Seminar with the author!